Dean Guitars are a well-known company specialising in making electric guitars, primarily versions of Gibsonâ€™s classic Modernistic series of guitars. As well as this Dean make high quality acoustic guitars and mandolins and banjos. The company was founded in 1977 by Dean Zelinsky, after whom the company is named. He wanted to make better guitars for rock and metal musicians than existed when the company started. When the company first started the main models in the range were the V, a copy of Gibsonâ€™s 1950s Flying V design, and the Z, a copy of the Gibson Explorer, the other guitar from the Gibson Modernistic series that was actually made and sold (there was a third guitar in the series, the Moderne, of which none were made, not even in prototype stage, until 1982). There was also a third guitar in Deanâ€™s range, the ML, which was a very well-executed blend of both the aforementioned Dean guitars – it consisted of the bottom half of a V and the top half of a Z. 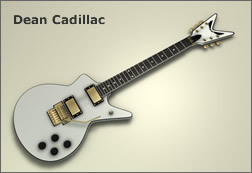 The guitars differed from Gibsonâ€™s designs by having no scratchplate and Deanâ€™s trademark headstock, a larger-than-normal model with a V shape. 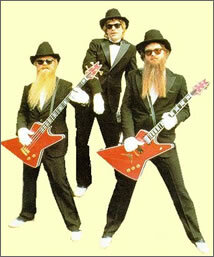 Early adopters of Dean guitars were Billy Gibbons and Dusty Hill Â of Â ZZ Top, who could often be seen onstage in the eighties with matching Dean bass and 6 string guitars. The 1980s saw several new models added to the range to accompany the V, Z and ML models. These included the Cadillac from 1980, a Gibson Les Paul bottom half and a Dean Z top half that works better than may be expected, and the 1983 Bel Aire, a pointier and smaller-bodied version of the Fender Stratocaster with one humbucker and two single coil pickups, which means it could be a prototype for the up-and-coming superstrat movement of the 1980s, which favoured pointy Strat-shape guitars with a better choice of pickups and more playing options than Fenderâ€™s original design. Also introduced in the 1980s was the Baby series, consisting of downsized versions of the V, Z and ML models.Â These guitars had Â¾-sized bodies, but full-sized 22-fret necks. The ordinary Dean models, particularly the ML, had very large bodies which made it harder for younger players to use. 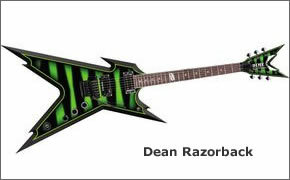 Dean have also exclusively designed some guitars for shred guitarist Michael Angelo Batio, who for a time held the record for fastest guitar player. He has also been voted the fastest guitarist in the world by Guitar World magazine. One such Dean custom guitar was a â€œquad guitarâ€, with four necks arranged in an X shape. Dean also made a double guitar for Batio, which looks much like the top half of this quad guitar. As of 2008 Batio has a new signature model, the MAB-1 Armorflame, a superstrat-shaped guitar with a silver flame paint scheme. Dean is perhaps best known for its work with the late Pantera guitarist â€œDimebagâ€ Darrell Abbott. Abbott was a huge fan of Deanâ€™s ML model, which was the only guitar he used when playing with Pantera and his last band, Damageplan. He had a signature ML made, with a dark blue paint job and lightning graphic. In 2003/4 Abbott worked with Dean to make a new model based on the ML. It was called the Razorback and resembled an ML with a much pointier body. A Razorback V model was also designed, a V-shaped guitar with these points on the body. Tragically, Abbott was shot dead in December 2004 while performing with his post-Pantera band Damageplan. He was killed by a mentally disturbed member of the audience, at the age of 38. The Razorback and Razorback V models were released in 2005 as a tribute to Abbott. Dean now has a large range, including the ever-present V, Z and ML models, the Razorbacks, which are available in a wide variety of custom finishes, the Cadillac, the Hardtail double cutaway, the Les Paul-style Soltero, the SplitTail and the Vendetta. Dean also have a very wide range of artist signature models, including the MAB-1, the CBV and MKH for Corey Beaulieu and Matt Heafy of Trivium, the Dave Mustaine VMNT signature series of Vs including a twin-neck V, the Michael Schenker series of Vs and the Leslie West Soltero.